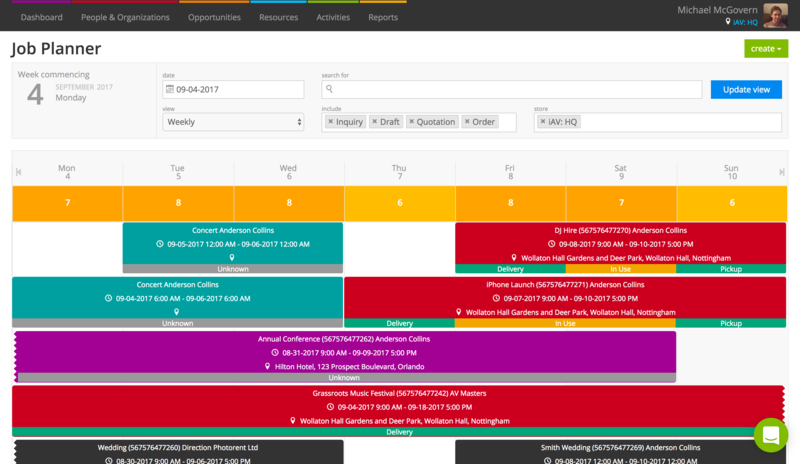 The Job Planner is a central calendar of all of the opportunities on your Current RMS system. To get to the Job Planner, go to Opportunities > Job Planner. The default view is a list of all orders in the current store for the next week. Set the start date by using the date field at the top. 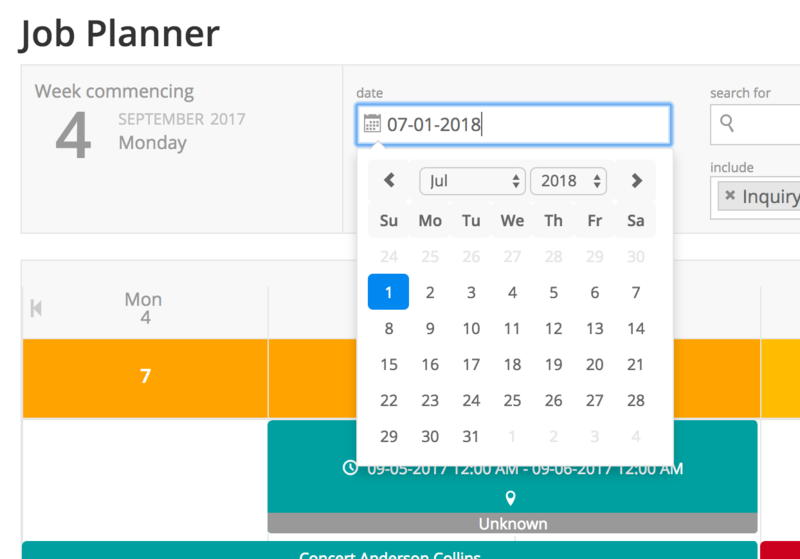 See a month, week, or day by changing the view dropdown box. Search the name of opportunities. Select which stores you’d like to include in your view. Hit the blue Update view button when you’re done. Opportunities for the period that match the filter criteria you’ve set up show in the calendar. Dates and times appear along the bar at the top, which sticks to the stop of the screen when you scroll. Opportunities are color coded depending on their status. These colors correspond to the colors of opportunities in your main opportunities screen. There’s a key at the bottom of the Job Planner for your reference. At the bottom of each tile, there’s a bar that breaks down the opportunity scheduler. For example, on the tile below I can see that we’re delivering on the first day, the in use days fall in the middle, and pickup is the final day. The number at the top of planner under the date shows how many concurrent opportunities you have going on, so it’s great for getting a quick overview of how busy you are. You can change when you consider your company to be busy by adjusting your heatmap settings in System Preferences. See your opportunities on the calendar on your smartphone, computer, or other device by subscribing to your iCal feed. Often, you can set up reminders on your calendar app so you’re notified when a job is starting, too. 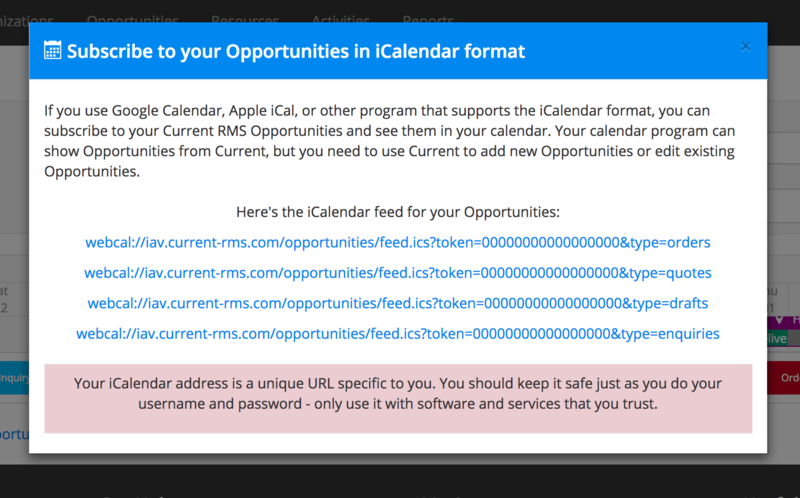 Use the iCal calendar feed for your opportunities link at the bottom of the Job Planner to access your iCal feeds.